I warmly congratulate the opening of this exhibition -- Contemporary Chinese Seals by Li Lanqing. Seal carving is a traditional art form unique to China. It has a history of more than two thousand years. It combines calligraphy and engraving in a small space. An exquisite Chinese seal requires exceptional skills in calligraphy and cutting. In addition, refined artistic taste must be combined with these skills to create the very finest seals. For all these factors it should not surprise that seal carving has been given global recognition. In 2009 Chinese seal carving was included on UNESCO’s list of world intangible cultural heritage. Mr. Li Lanqing is a former leader of China, a well-known statesman. He made a huge contribution to China’s economic and social development. This was especially notable in the progress in trade, culture, education, science and technology. Since leaving government office Mr. Li has been committed to an active retirement. He says he aims to be “fit in body and have a sound mind through reading and creative work”. In his retirement Mr. Li has delved deeply into music, poetry, painting and other genre of the arts. In particular we all applaud his outstanding achievements in seal carving. · First, building on traditional skills, Mr. Li has boldly employed some new and innovative techniques. This has given his seals a fresh style and enabled him to better reflect what is happening in today’s China. He has pushed new frontiers on all fronts: content, theme, formality, skill, material and tools. From his innovation, the time-honoured art of Chinese seal carving has taken on a new look and vigour. 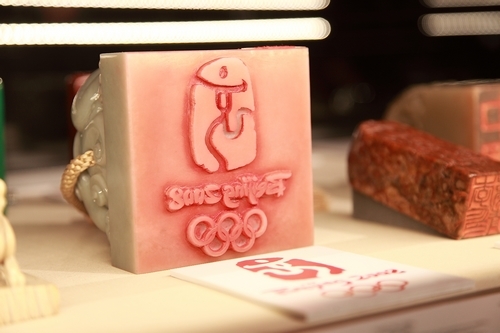 · Second, Mr. Li is a strong advocate of popularising seal carving. However, seal carving is an art of the intelligentsia. So, by giving lectures and writing books in a user-friendly language, he has brought seal carving to interest ordinary people. Many of these are excited to find out how fascinating seal carving is. Growing popularity of seal carving is creating a bright future for this ancient treasure of China. · Third, Mr. Li has introduced Chinese seal carving to the world. This has turned seal carving into a bridge for cultural exchanges between China and western countries. In recent years, Mr. Li Lanqing has held exhibitions of his seals in Russia, Singapore, France and Indonesia. His seals have become a means to increase understanding about Chinese culture and history, and about how Chinese people see the world. With his creativity, Mr. Li has brought China and the world closer to each other. Today, we are very pleased that Mr. Li Lanqing’s seals have once again traveled abroad and come to the UK. I believe that Britain will much appreciate this opportunity as it is a country renowned for its appreciation of rich cultures from all parts of the world. At this exhibition in the British Museum visitors will see 108 seals and two pieces of calligraphy by Mr. Li Lanqing. This is a selection of his finest works. A collection of the imprints of his seals and samples of his carving tools will also be on display. I want to particularly mention that Mr. Li has specially created 14 seals for this exhibition. Twelve of them are devoted to famous British historical and cultural figures that he has long admired. These include Shakespeare, Newton and Darwin. In addition there is an Olympic link. To congratulate the success of the London Olympics, we have put on display the famous seal Dancing Beijing. It was the official emblem of the Beijing Olympics in 2008. This seal is an epitome that embodies all the fine elements of Chinese seal carving. The seal was selected for the Beijing Olympics by Mr. Li Lanqing. I have no doubt that you will be impressed by its exquisite beauty and the author’s artistic stature. Mr. Li Lanqing and Britain are no strangers to each other. He is an ardent supporter of China-UK relations and friendship. In 1996 he visited the UK as Vice Premier of China and during his working career he played a major role in advancing China-UK relations. This was especially the case in promoting China-UK economic cooperation. 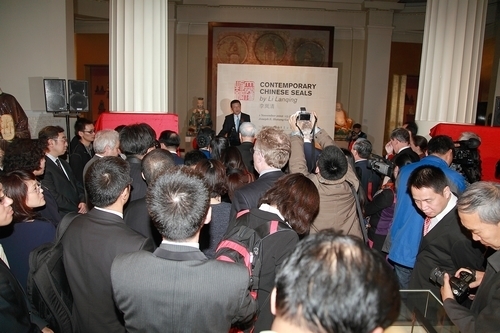 Today, the seals of Mr. Li will add another highlight to China-UK cultural exchanges. 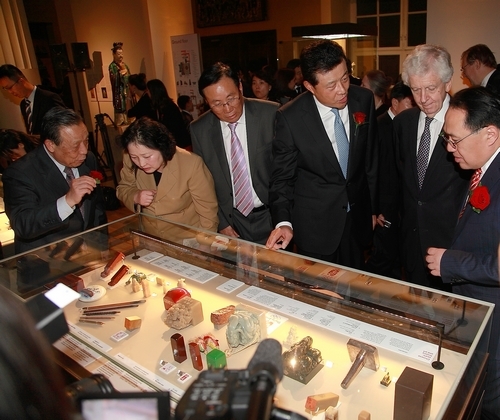 Recent years have seen expanding and deepening cultural exchanges and cooperation between China and Britain. Chinese and British people have a keen interest in each other’s culture. So, I am confident that China and Britain will achieve common prosperity through cultural mutual learning. In turn, mutual understanding and friendship between our two peoples will also be strengthened through cultural exchange. 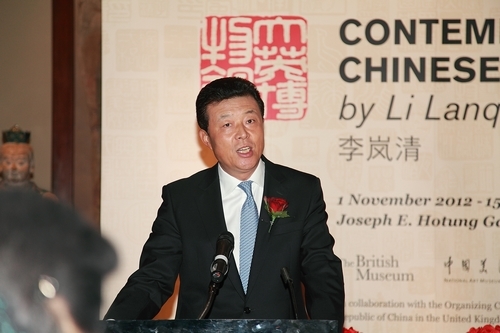 I want to stress that British Museum has played an important role in China-UK cultural exchange and cooperation. As host of this exhibition, British Museum has made meticulous efforts in the design and arrangement. It also selected five seals from its own collection for display on this exhibition. I highly appreciate what British Museum has done. I also want to share with you the good news that Mr. Li Lanqing has created two seals, meaning respectively, British Museum and Admonitions of the Court Instructress. The latter is the title of an ancient Chinese painting now kept in the British Museum. Together with the 12 Britain themed seals I mentioned earlier, they will be presented to British Museum as a keepsake. I hope they will become part of the valuable collection in the British Museum. In conclusion, I wish the exhibition, Contemporary Chinese Seals by Li Lanqing, a great success.